This is the time of year for traditions. A tradition of this column is helping techies get ready for the inevitable requests from family members to take a quick look at their computer. That column is still relevant. I’ve posted it to www.FamilyTechOnline.com if you want to check it out. Despite the thanklessness, those of us not intimidated with technology often want to help our family. For seniors especially, having working technology keeps them in contact and engaged with family via Facebook and email. It helps them not feel isolated if family is not nearby. Here’s a few new thoughts this year on that topic. If a family member’s computer is hopelessly infested with viruses and malware, or so old as to be dreadfully slow, it is time for them to consider new hardware. If you find a PC running XP or Vista, that’s a sign. XP was last installed on new PCs seven years ago. Vista was an awful operating system. Vista machines may be upgradable to Windows 10, but the cost should make one consider spending more and buying a whole new PC. Vista is not one of the previous versions eligible for a free Windows 10 upgrade. It’s like putting a new engine in a car. Sure, it costs less than a new car, but now you have a new engine driving old parts. And XP machines probably would not make good Windows 10 PCs. They wouldn’t be fast enough nor have enough memory. If a PC should be replaced, ask questions about how they use a PC. If all they do is use Facebook, email and online games such as Words with Friends then perhaps they do not need a full PC. Viable alternatives would be an iPad or Android tablet. Although I’m deeply entrenched in the Google/Android ecosystem, for someone with only one device – a tablet – I’d urge them to choose an iPad. They are easy to use and if there is an Apple store near a relative, their Genius bar offers excellent and patient support when you are not around. If they want to a more traditional PC device, and perhaps are not comfortable with touch screens, a Google Chrome device might be appropriate. These are inexpensive laptop-looking devices that run just a browser. It is more than suitable for Facebook and email. The one app a senior might use that is not supported well by a Chromebook is Skype. However, it does support the free Google Hangouts if you want to continue video calling them. The beauty of Chromebooks is they are essentially virus and malware free. And, the operating system upgrades automatically. While it does not run Word, or other Office apps, for the kind of user Chromebooks are best for, Google Docs works just fine. The documents are stored on the web, and Google makes copies of them so backups are not needed. Their low maintenance is why they are popular in schools and could be good for some users such as seniors needing Facebook, email, photos and other services that can be served up on the web. 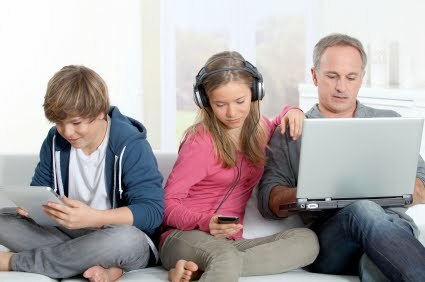 Another thing you can do for your family members is check their internet connectivity. On a PC, go to speedtest.net and click the “Begin Test” button. Do not click the “Scan Now” button; that’s an ad. SpeedTest.net also has apps for iPads, iPhones and Android devices. Check the speed at various places in the house. If you do not have connectivity, or poor connectivity, in parts of their home, check next week’s columns for ways to improve connectivity. The column mentioning this column will be posted Saturday, November 14 at 9 AM here.